One of my favorite things about this time of year is strawberries. Once strawberries come into season, I literally can’t stop eating them. They’re so completely different from the gargantuan, white-centered, flavorless berries you get at the grocery store, it’s almost like they’re a completely different fruit all together. And I just can’t get enough of them. At least I’m not alone, as can be deduced by the increasing number of small children at farmer’s markets with their faces covered in red juice. So now that strawberry season is in full swing, you can expect several posts of delicious recipes to showcase this delectable fruit. 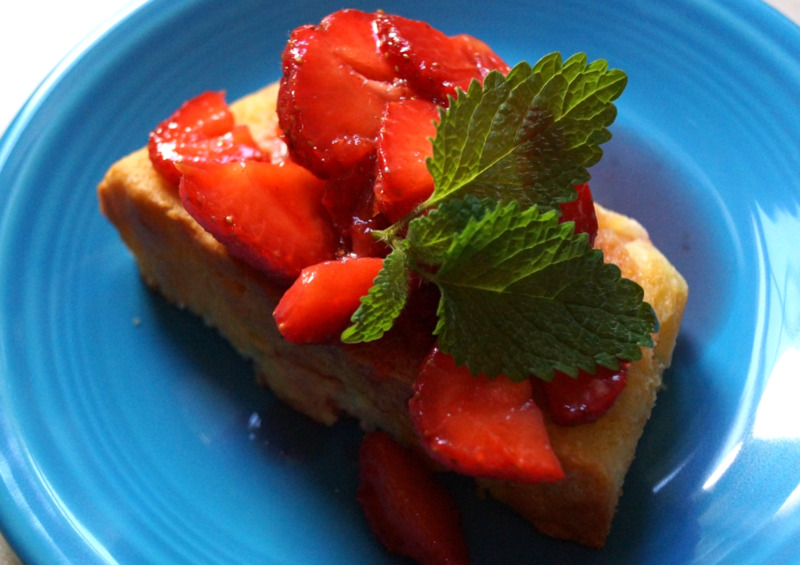 And to kick things off, I’m starting with a lovely, moist lemon cake, the perfect vehicle for sopping up the sweet red syrup of macerated strawberries, which my husband keeps mistakenly calling ‘emaciated strawberries’. I promise you, they are anything but. A note on lemon balm- if you don’t already have this growing in your herb garden or a pot somewhere, you should definitely start. It’s easy to care for, and like it’s cousin, mint, is extremely prolific. I use it quite a bit in the summer to make herbal iced tea, it’s great with berries, and it’s pretty fantastic when muddled in a refreshing summer libation. Most greenhouses that carry herb transplants will have it, or if you can get your hands on some cut stems, put them in a glass of water at room temperature (say on your windowsill), and after about a week, they’ll have grown roots and you can transfer them to a pot or planter. 1. Preheat oven to 350 degrees and grease a 9-inch loaf pan. 2. Mix the flour, baking powder, and salt together in a medium bowl. 3. Cream the butter and sugar together until fully combined and the mixture is light and fluffy. 4. Add the eggs, followed by the yogurt, continue mixing until thoroughly combined. 5. Add the flour mixture, and mix until you reach a smooth consistency. Stir in the lemon juice, zest, and vanilla. 6. Pour into prepared loaf pan (batter will be thick) and bake at 350 degrees for 50 minutes or until the top is golden and a toothpick inserted into the cake comes out clean. 7. While the cake is baking, combine the strawberries, sugar, lemon zest and lemon balm; allow the mixture to sit at room temperature for about 1 hour. 8. Serve cake in slices topped with the berry mixture.